This earnings season, companies are announcing results for the first quarter of 2018. It is the first full accounting period that includes the changes related to tax reform. Many companies are benefiting from a lower tax rate. But, tax reform also forced companies to move cash that was held overseas back to the United States and includes provisions to prevent large cash balances from building up overseas again. This is significant because it means companies will make the best use of cash in the future. This means there have been two big stories this earnings season and both are affecting the stock market. “In terms of earnings, more companies are reporting actual EPS above estimates (78%) compared to the 5-year average. If 78% is the final percentage for the quarter, it will mark the highest percentage of S&P 500 companies reporting actual EPS above estimates since FactSet began tracking this metric in Q3 2008. The percentage of companies reporting EPS above the mean EPS estimate is above the 1-year (74%) average and above the 5-year (70%) average. In aggregate, companies are reporting earnings that are 8.3% above the estimates, which is also above the 5-year average. In terms of sales, more companies (77%) are reporting actual sales above estimates compared to the 5-year average. 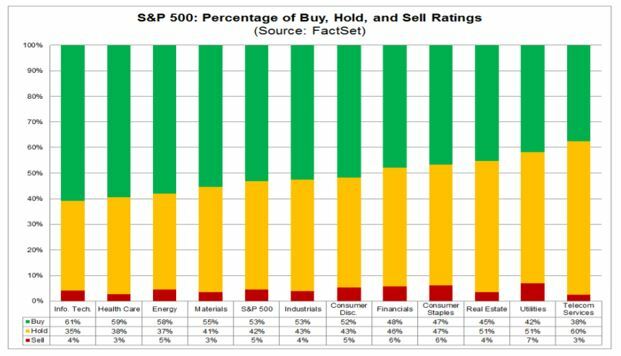 If 77% is the final percentage for the quarter, it will mark a tie with the previous quarter (Q4 2017) for the highest percentage of S&P 500 companies reporting actual sales above estimates since FactSet began tracking this metric in Q3 2008. The strong gains in earnings have led to a decline in the price to earnings (P/E) ratio, as the chart below shows. The stock market is forward looking and using expected earnings is an effective way to value the stock market. This is called the forward P/E ratio. Based on revisions to earnings estimates prompted by the strong earnings reports, the forward P/E ratio for the S&P 500 is 16.5. Bears will point out that this P/E ratio is above the 5-year average of 16.1 and above the 10-year average of 14.3. 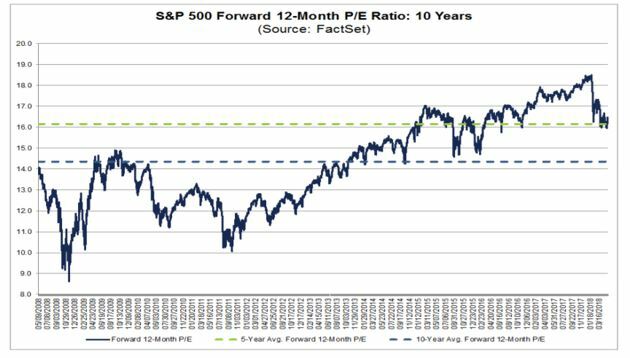 They can also argue that this ratio is also above the forward 12-month P/E ratio of 16.4 recorded at the start of the second quarter. Since the start of the second quarter, the price of the index has increased by 3.1%, while the forward 12-month EPS estimate has increased by 2.4%. Bulls will be able to argue that earnings estimates are still being revised and the earnings picture is likely to be better than expected in the next few quarters so the ratio should be higher than average. Bears are also concerned that companies are buying back too many of their own shares. They argue that by using cash for buybacks, they are not investing in the business to generate growth in the future. This ignores the reality that companies often have enough cash to buy back their shares and to reinvest at the same time. Analysts at the investment firm UBS have studied how companies are using their cash and their data supports a bullish conclusion. They did find that share buybacks are up by 16% compared to a year ago, so companies are using some cash to reduce the number of shares outstanding. The research also found that companies are using cash to increase the amount they pay in dividends, with dividends up 11% compared to a year ago. While buy backs and dividends do reward share holders, companies are also investing in the future. UBS found that capital expenditures, the amount of money companies reinvest into their existing operations, are up 39%. 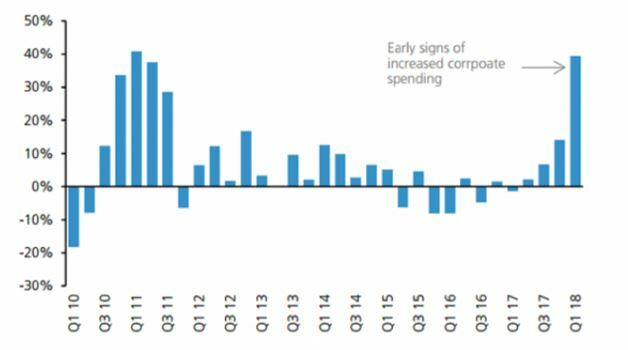 The increase marks a sharp break from the recent past when capex was declining or growing slowly. Analysts are finding reasons to be bullish based on earnings, sales and how companies are deploying their cash. Based on the latest data, FactSet notes that “The bottom-up target price for the S&P 500 is 3079.59” which is about 13% above the recent price of the index. The bottom-up target is based on the price targets of the individual companies in the index. Analysts are most optimistic about the Telecom Services sector where this process shows a potential gain of about 19.5%. All sectors are undervalued using this technique but the Energy (+6.9%) and Utilities (+7.3%) sectors are expected to see the smallest price increases, as these sectors have the smallest upside differences between the bottom-up target price and the closing price. Turning to individual stocks, the latest research shows that there are 11,082 ratings on stocks in the S&P 500. Of these 11,082 ratings, 53.2% are Buy ratings, 42.2% are Hold ratings, and 4.6% are Sell ratings. At the sector level, the Information Technology (61%), Health Care (59%), and Energy (58%) sectors have the highest percentages of Buy ratings, while the Telecom Services (38%) and Utilities (42%) sectors have the lowest percentages of Buy ratings. All of this indicates that investors could enjoy significant upside potential in the stock market over the next few months. The outlook of analysts is unusually bullish and companies are recording large gains in both sales and earnings. The gain in sales is a reflection of a strong economy while the earnings are at least partly due to one-time tax gains. The bottom line for investors is that they should avoid panicking and enjoy the potential in the market as long as it is available to them.